The long hair. The black outfits. The sullen attitude. In the world of 1D, growing up means acting like rock stars. And the five-piece boyband have done a lot of growing up over their four album career: from the cheesy escapades of What Makes You Beautiful, to the 80s soft rock of current single Steal My Girl that fittingly wouldn’t sound out of place on the soundtrack to coming-of-age film The Breakfast Club. 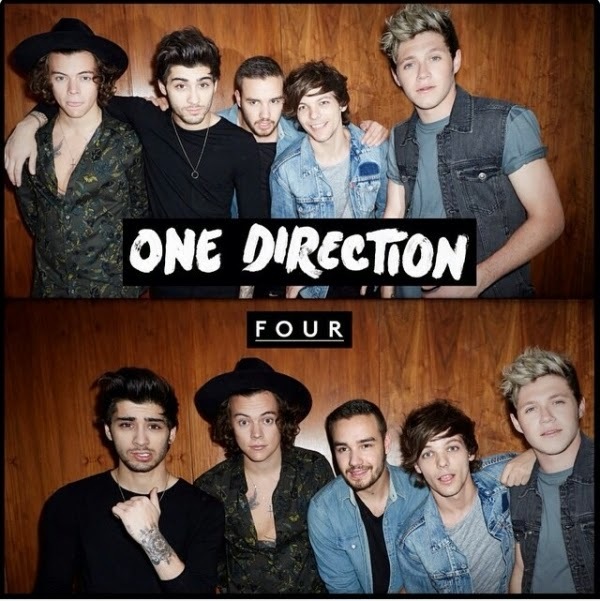 ‘Four’ sees the boys dropping the 60s inspired pop of their past albums for an 80s guitar sound. That’s a change that we’ve all seen coming gradually, for better or worse. Diana was one of the highlights of the last album and the best of 'Four' follows suit. Yet those who bemoaned the Mumford-esque balladry of ‘Midnight Memories’ won’t find much to enjoy on insipid love songs like Ready to Run, Fools Gold, Night Changes and the Ed Sheeran bore-fest 18. Too often, the album coasts along on mediocre tracks on which the boys take themselves far too seriously. You can’t begrudge them for at least writing their own material, but equally you wish they’d lighten up a bit. And lighten up they do, on occasion. They might be aiming towards rock stardom, but the music remains grounded in their pop roots and it’s here where the album succeeds. Steal My Girl is as catchy a lead single as they’ve ever released, whilst Where Do Broken Hearts Go features a pop-rock shout-along chorus, Fireproof takes a more laidback approach with its West Coast harmonies, and Spaces is a typical boyband ballad flavoured with guitars that perfectly represents where the band are currently at. Best of all is Stockholm Syndrome with its infectious syncopation and driving guitars – as with Taylor Swift’s latest album, it successfully updates 80s pop with a contemporary edge. That this song (as well as Where Do Broken Hearts Go) was co-written solely by Harry Styles (Liam Payne and Louis Tomlinson co-wrote most of the album alongside other pop songwriters) just proves which member has the most personality. Maybe they should listen to Styles more often? As the unimaginative album title suggests, ‘Four’ is hardly an original album. The 80s style alone is nothing new, the opening of Ready to Run is pure Avicii, the guitar lines in Change Your Tickets are practically identical to Girls from The 1975, and Act My Age weirdly combines a hoedown with dub-step. Other songs often sound like rehashed versions of old singles, but if anything it adds up to the most cohesive and complete 1D album to date. Yet where Beyoncé’s album of the same name was full of singles, here many of the tracks fail to stand out. With all the reports of separate transportation, fights and illness, many are predicting the imminent demise of 1D. They’re undoubtedly best known for their overall brand and their ability to induce hysteria and pant-wetting in young girls rather than their music, but it’s clear the boys wish to change that. 1D may be a tired boyband, but musically they’re just hitting their stride. Listen: ‘Four’ is available now.